Yesterday was a holiday in Quezon City so most offices and schools were closed. It was not a holiday elsewhere so through traffic along Katipunan Avenue would have been “normal.” This is assumed especially for trucks that have been blamed as the cause of the severe congestion. I was curious about how traffic would be with the holiday in QC and through traffic could practically be “isolated.” There still was significant traffic generated by establishments like restaurants and cafes along Katipunan. It was a regular weekday and not like it was a Sunday. 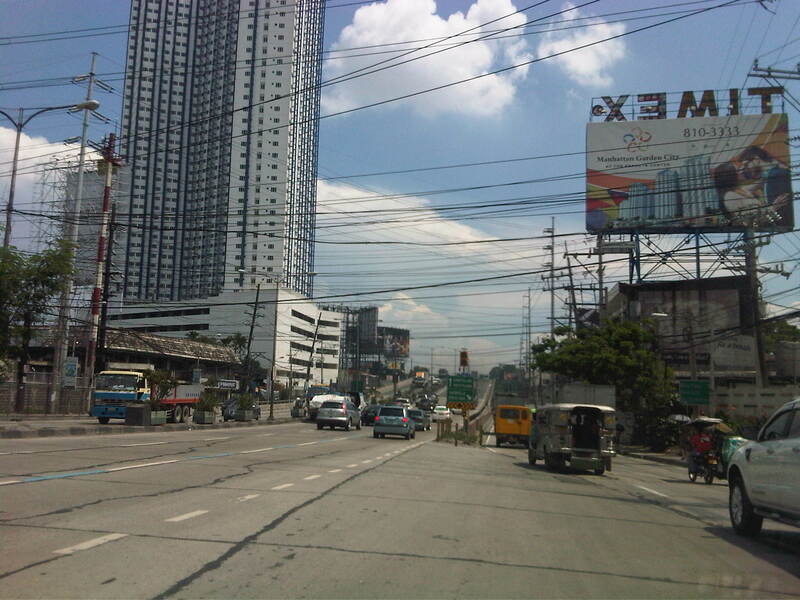 Following are photos that were taken around 2:00 PM when the truck ban is not enforced in the area. Free-flowing traffic along the section across from the UP Town Center – There were no long queues at the approach to the Katipunan-C.P. Garcia intersection. Free-flowing traffic along Katipunan across from Ateneo – the two universities generated few private car traffic yesterday during a period when there’s usually a lot coming in and out of the campuses due to the dismissals in the early afternoon. Free-flowing traffic along the Katipunan-Aurora overpass – in the early afternoons, the northbound side of Katipunan is usually full of vehicles mainly private cars and trucks. While there were many trucks yesterday, their numbers were not enough to cause traffic jams. I think the traffic situation yesterday provided a clear picture that the major traffic generators along Katipunan are mainly the reason for traffic congestion along the stretch from Blue Ridge to Balara. These are mostly the schools (Ateneo, Miriam and UP) that generate so much private vehicle traffic on weekdays and Saturdays. Sundays are different because there’s no school nor work at offices on this day. With the QC holiday, the through traffic was still there owing to work and school in other cities (e.g., Residents of QC would still have to travel to Makati or Ortigas if their workplaces are located there. Similarly, students residing in QC whose schools are in the University Belt in Manila would have to travel.). This means there is really a need to understand why there is congestion and what causes it. A lot more effort is needed for this understanding and to ultimately reduce traffic congestion along this stretch of C5. Pointing fingers among agencies and simply putting the blame on one sector of traffic (e.g., trucks) will not get us anywhere. The solution will require strong cooperation among stakeholders and will definitely be not a painless undertaking for many. By d0ctrine in Traffic Congestion, Traffic flow, Traffic Management on August 20, 2014 .